Graph ruled, white paper, 100 sheets per 1 pack (Sold as 8 pack). Reinforced three-hole punched paper. Double the strength of competition. More durable triangle-shaped hole and stronger reinforcement tape resists tearing. Heavyweight 20# paper resists ink bleed. 4x4 squares on front and 5x5 squares on back. 11" x 8 1/2". Pages are graph ruled and double-sided to provide plenty of notetaking space; 4 sq./inch on front and 5 sq./inch on back. 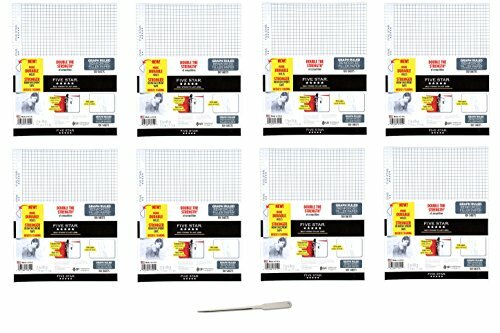 100 white loose-leaf sheets per pack. 11" x 8-1/2" page size.